Greg James (October 24, 2006) - The Muppets always seem to make Christmas merrier. With half-a-dozen Christmas productions already under their belts, the Classic Muppet Show characters continue the familiar tradition with a new CD, entitled "A Green and Red Christmas". Order the all-new Muppet Christmas CD for only $9.99. This CD is 12-tracks of all-new holiday cheer that will surely be a classic for years to come. The CD is 100% newly recorded direct-to-CD content. This isn't a cheesy compilation; this is a full blown Muppet album. The last Muppet album of this level was "Kermit Unpigged" back in 1994. What really impressed me with the album is that there were no gimmicks. There are no superfluous celebrity duets. There's no insincerity or awkward attempt to conform a style of modern trends or what's "hip". There's no lame story-line or plot attempting to validate each performance. This album is just the Muppets being the Muppets – and it's all new. What could be better? The previous standard for a Muppet Christmas album was 1979's "John Denver and The Muppets: A Christmas Together". Whereas that album relied on traditional Christmas carols (and John Denver), this album embraces the modern holiday classics of the past century. The album kicks off with the ever-wonderful Dr. Teeth and the Electric Mayhem. For over a decade the band has been stuck doing instrumental gigs (their last performance with any significant vocals in 1990's "The Muppets at Walt Disney World"). Dr. Teeth is back in full swing leading the band in "'Zat You, Santa Claus? ", a classic tune made popular by Louis Armstrong. The song is performed in a very Mayhem-ish manner, I could just picture the band up on the Muppet Theater's stage singing. What a great way to kick off the album. Kermit and Miss Piggy take the next track as they sing about the true color of Christmas. 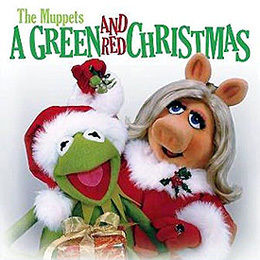 In the tender and calm song, Piggy explains all that is red with Christmas while Kermit, naturally, supports the green side of the season. Ironically, "A Red and Green Christmas" is probably the weakest of all the songs on the album (although it is still quite enjoyable). 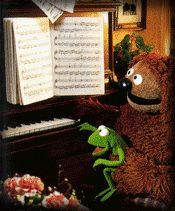 Rowlf the Dog is at the piano singing about all his favorite Christmas songs. From Rudolph to Frosty, Rowlf expresses his feelings towards the good ol' fashioned Christmas party sing-alongs. Another big step for this album is the vocal return of Rowlf (who hasn't uttered much more than a sentence since Jim Henson's death.) Rowlf is in perfect character here. The song is up-beat, toe-tapping, and retains that level of classical good old fashion fun we've come to expect when Rowlf is at the keys. Pepe is on the microphone next, singing his little prawny heart out with "Merry Christmas Baby". The song, made famous by Bruce Springsteen, is a perfect choice for Pepe. I never thought of Pepe as much of a singer before, but I will never underestimate the talent of the king prawn again. This is a great track, a perfect blend of Christmas and Muppets. The next song features the Electric Mayhem again. Floyd takes vocals for "The Man with the Bag", a song probably best known for its rendition by Kay Starr. Zoot shows his sax skills, Animal beats the drum and Dr. Teeth rocks the keyboard. The song is a perfect fit for the characters. 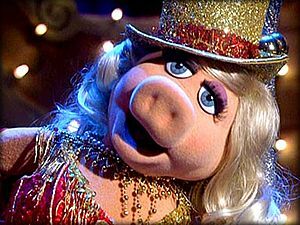 Miss Piggy goes solo on the next track as she performs a stunning version of "Santa Baby". 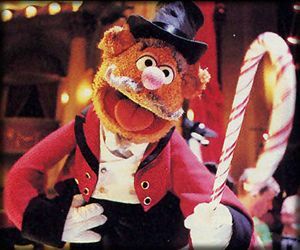 Piggy had previously sung part of the song in "It's a Very Merry Muppet Christmas Movie" (during the Moulin Scrooge number). Once again she knocks it out of the park. This song seems to have been made for Piggy (despite being written 23 years before the pig's genesis). Piggy owns this song and can justly join the ranks of the other "Santa Baby" singers - including Eartha Kitt, Madonna, Kylie Minogue and The Pussycat Dolls (to name just a few). Gonzo and Rizzo unite to perform a stirring rendition of a classic tune. The relaxed and familiar chemistry that Gonzo and Rizzo bring to everything they do together is really present here. The earnestness and humor of the duo balances perfectly, and the classic pair provides yet another wonderful track. This is among my favorites of the whole CD. "North Pole Comedy Club" is an entertaining track full of even more classic Muppet spirit. Fozzie Bear gives an amazing Christmas-themed comedy act, amid the heckling and remarks from Statler, Waldorf, Pepe and others spectators. The song is somewhat reminiscent of Fozzie's stand-up act in "A Muppet Family Christmas" (only longer, and with out the snowman sidekick). Fozzie is great at telling these terrible jokes, and it's just so hard not to love him. Dr. Teeth and the Electric Mayhem are back for track #9 where they perform yet another groovin' holiday tune. This time it's a cover of Chuck Berry's famously recorded "Run, Run Rudolph". Dr. Teeth and the band really jam on this track while keeping that unparalleled "Mayhem sound" that their previous hits are known for. Here lies another future Christmas classic. One of the best qualities of the Swedish Chef is that the more you don't understand him, the more you love him. The next track puts everyone's favorite Scandinavian cook in the spotlight. The novelty of this song might wear off if you're not a fan of the chef, but if you're anything like me you could listen to his "börking" all day long. "Christmas Smorgasbord" focuses the wacky and weird side of the Muppets. It's silly, it's funny, and I don't quite get it. And that is exactly why I love it – it's precisely the kind of track you would expect the Swedish Chef to be involved in. 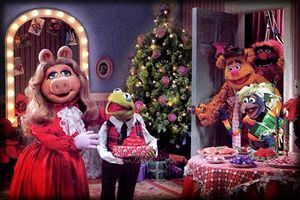 The next song, featuring Miss Piggy, is a mixture of holiday cheer and obligatory pig put-downs. I always love when Piggy is trying to keep her cool amid insults, swine jokes and other deprecating comments. This song has some hilarious lines from the back-up chorus, and is one of the more irreverent holiday tunes on the album. Piggy tires to keep the act elegant and classy, although, as usual, that proves quite impossible. The album concludes with a heartfelt and moving rendition of "Have Yourself a Merry Little Christmas" sung by Kermit the Frog. This isn't the first time the Muppets have performed this song, but this is one of the best renditions I've heard. It leaves you with a warm holiday feeling. It's quite touching and an apt end to a delightful holiday album. Now no review of this album would be complete without mentioning the recent recasts featured prominently on several tracks. The CD marks audiences' first real exposure to Bill Barretta as Rowlf the Dog and Dr. Teeth (previously the characters of Jim Henson) and the first real taste of John Kennedy as Floyd Pepper (previously the character of Jerry Nelson). This isn't the first time Barretta and Kennedy have performed these characters, but it is their first role of any real substance since inheriting them. With the longevity and timelessness of the Muppets, performer recasts are inevitable; either a character disappears into obscurity or a new performer has to be allowed to re-embody the character. These transitions can be awkward and uneasy, especially for fans that have become so invested and attached. However, of the 13 characters on the album there are only three (Gonzo, Rizzo and Pepe) that still have their original performer, yet everyone seems in perfect form here. Seeing a new voice coming from the puppets can really help alleviate some of uneasiness associated with the change, and the fact that this release relies solely on audio doesn't help with alleviating any possible scrutiny – if nothing else fans will probably be more critical. But I must say that Barretta and Kennedy are doing wonderful jobs with their new roles. Both performers get close enough to the original voices while avoiding stale and uncharacteristic imitations. I mean, it may not be Jim singing but it defiantly is Rowlf singing. Both performers do a great job capturing the spirits, integrities and personas of these beloved characters, and I'm sure that with a few more exposures fans will come to accept theses newer incarnations the same way they've come to embrace Steve Whitmire's Kermit and Eric Jacobson's Piggy. The CD does a lot of things right and, in my opinion, this is the best original-content (i.e. non-soundtrack) Muppet CD ever released. The songs are perfectly selected and wonderfully executed. My only real complaint is that I wish it was longer. With a runtime of just shy of 40-minutes, another 2 or 3 tracks would have greatly bulked up the album. I would have loved to hear Johnny Fiama and Sal perform a Sinatra-esq ditty, Bunsen and Beaker chiming in from Muppet Labs, the Muppet chickens cluck "Jingle Bells" (akin to those infamous barking dogs), or just a big group song with the whole troupe chiming in. Additionally, the vocal absence of Janice in the Electric Mayhem's appearances is a bit disappointing (none of the tracks suffered because of it, but as a fan I would have liked to have heard her). "A Green and Red Christmas" has the potential to become a new holiday classic. This album exceeded my expectations. It has even surpassed the dated and slower-paced sentimentalities of "A Christmas Together" to rise to the top of my holiday play list. So if you haven't already gathered, I think the album is great and highly recommend this album as an excellent addition to anyone's Christmas or Muppet CD collection. It is full of great songs that are sincere, wacky, heartfelt, and very "Muppetational". Want more Muppet Christmas music? 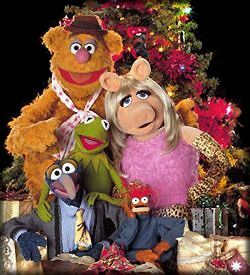 Beginning Friday November 24 and continuing through Christmas Day, you'll be able to hear 200 of the best Muppet Christmas songs of all-time on Muppet Central Radio. Merry Christmas everyone!